LONG TEXT WARNING. Also, I'm back! 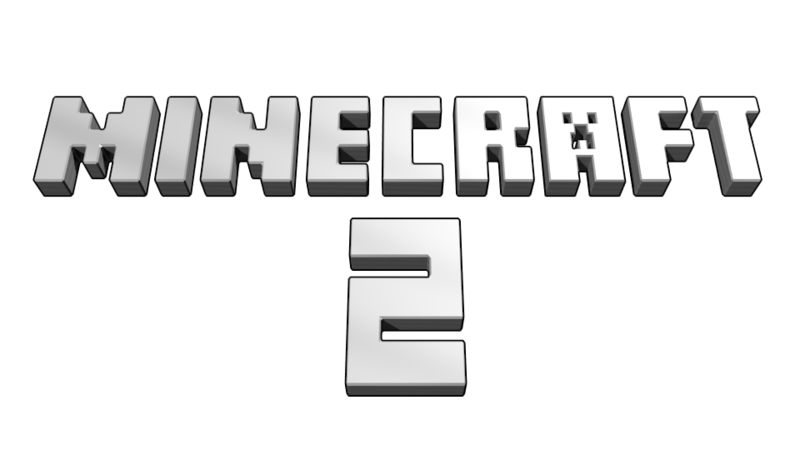 NOTE, PLEASE READ FIRST: I DO NOT THINK WE NEED A MINECRAFT 2. HOWEVER, I THINK IT WOULD STILL BE A GOOD THING. I've explained this before, and I don't feel like mentioning it again for the millionth time. Yes, I know you could just add these suggestions in the current game, but to do so would require quite a few rewrites and rebalancings that it honestly would just be better to make a new game. Besides, as 1.9 taught us, even minor changes, if they effect a major enough portion of the community, can split it, so this many overhauls would probably cause huge uproars. I feel it would be better to keep the current game you love untouched, with this new, different version available for those who are tired of the old game and want something fresh. If you want my full opinion on why I think a Minecraft 2 would be beneficial, you can view my opinion on that in Part 1, and there are many times throughout the parts in this suggestion series where I go more in-depth. 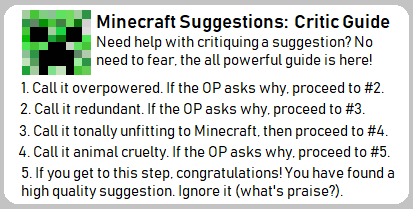 Anyways, I would appreciate it if criticisms were more pointed at the suggestion itself and not at whether Minecraft 2 should exist. Without further ado, though, lets get into the suggestion itself. The Overworld is the most important dimension in the game, possessing the most content and being the most livable area in the game. Hence, the most detail will be put into this dimension. However, as it's quite an undertaking, the Overworld will be split into two separate parts, the surface (this suggestion, above y=0) and the underground (below y=0). There will be new stuff to do, new structures, and new mechanics. The Overworld itself will have the most variety. Most of the stuff from the current game will return; however, a couple of things will be cut if I can't justify its existence. Remember, 0/1/2 means 0 on easy, 1 on normal, and 2 on hard. 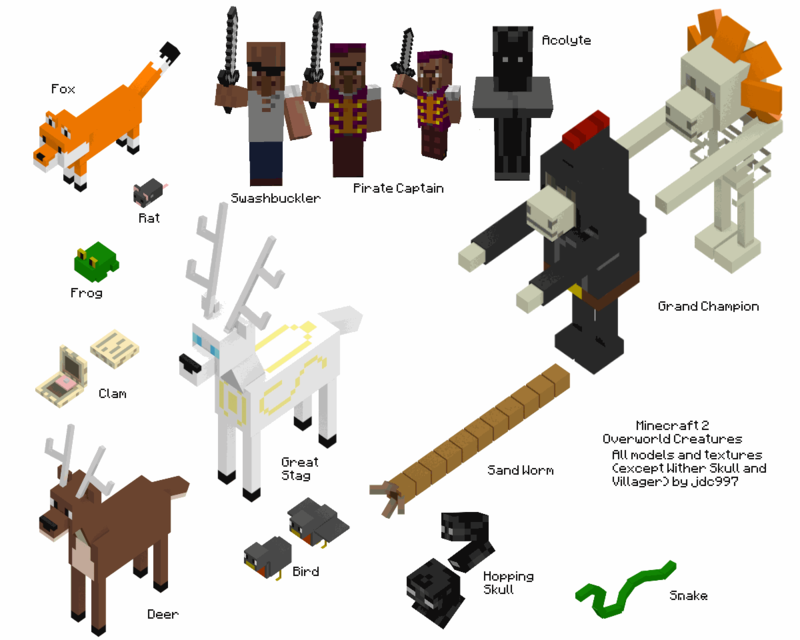 I've attached a couple of images to this post showing models of important new mobs and concepts for the new dungeons. Keep in mind that they are not to scale, and are only meant to give you an idea of what they look like. Were they implemented, they would look much more professional. Also, if something already exists, or is similar to something that already exists, I didn't give it a picture. There are 32 unique biomes in the surface Overworld, split into 5 types: Hot, Temperate, Cold, Ocean, and Sky. The surface is split into 32x16x32-chunk areas called regions (which is used in the current game). Each region comes in the first 3 types, with all regions above the initial 16-chunk height being considered Sky. One thing I've always disliked about Minecraft post-1.7 is the addition of the temperature system. It lead to just getting the same old biomes over and over. However, without temperature, we're left without a lot of realism, such as deserts next to snow biomes. We need a way to apply proper realism, but limit it so that the same temperature does not exist over an incredibly large area. To do this, Temperate biomes occur in a checkerboard pattern with Hot and Cold biomes filling in the gaps with even frequency. This means that Temperate biomes will be the most common, but they typically have the most content anyways. Oceans will spawn randomly and will consist of 5-15 connected regions. Sea level is y=32. Biomes will also have unique dynamic music, instead of the music just playing with no regard for what you're doing or where you are. Music will start to fade out as it comes to sunset, and some more dire chords will come in if there are a lot of enemies. Songs will all feature the piano, like current Minecraft, but there will also be a large variety of instruments to supplement. Biomes are given in the order as they appear in the wiki, with new biomes at the end of each section. Ice Plains: Snow-covered, mostly flat land with little life, beyond some undead, rabbits, polar bears, and foxes. Ice spikes also occasionally spawn. The surface underground (above y=0, but below the direct surface) will consist largely of ice and snow blocks with occasional stone blocks and low-tier ore. Music is soft and slow, using bells and violins with the piano being the starring instrument. Taiga (D, M): The old Cold Taiga. Spruce trees in a relatively flat snowy landscape, with more life, such as wolves and terns. The surface underground is a mix of dirt and snow blocks. Uses the Ice Plains music. Has a Dense Taiga variant with more trees. Extreme Hills (M): High hills that have snow on the top and spruce and oak trees, with occasional birch and maple. Surface underground is more standard, with lots of andesite. Music is generally quiet, with some slow piano and violin, and some "Viking drums." Crystal Forest (D): A rare forest biome consisting of crystal trees. The ground is snow blocks, with occasional patches of ice. The surface underground is made primarily of packed ice. Uses the Ice Plains music, but with an additional jingle bell track. The player can only ever initially spawn in a temperate biome. Plains: Relatively flat land with a lot of grass and small lakes, and a couple of of flowers. The surface underground is standard, consisting largely of stone with some dirt. This biome has two variants, being sunflower plains, containing a lot of sunflowers, and flower plains, which contains a lot of other flowers. The music is similar to the calm ambient music of the current game, and has four different songs to play, including remixes of "Minecraft (Calm 1)" and "Sweden (Calm 3)." The surface underground and music is the same as the Plains music. Swampland (D, M): a flatland with a bunch of water, lily pads, mangroves (a large oak tree variant with exposed roots and growing vines), and mushrooms. The surface underground is primarily dirt, with a bunch of slimes. There is an ambient fog that reduces visible distance by half, with rendered blocks and characters beyond the fog just showing a silhouette. Uses the Jungle music. Mystic Lake: a rare, tranquil biome consisting of a large lake surrounded by trees and flowers. In the center of the lake is a large indestructible boulder with the sword "Excommunicator" stuck into it. The sword can be pulled out by interacting with it as long as the player has a strength II or greater effect, and doing so makes the boulder breakable. Occasionally, a Great Stag can spawn which drops mystic leather for making mystic leather armor. No enemies naturally spawn here, and undead will flee should they get into the biome. The lake will slowly heal the player and other mobs who get in, though undead will be rapidly damaged instead. The surface underground is the same as Plains. The music is quiet, consisting of just some occasional soft piano notes, and not really being a full song. Jungle (D, M): a biome consisting of huge trees, shrubs, cocoa, and a bunch of rivers. The land is pretty uneven, making this biome difficult to traverse. The dense variant has a full, thick canopy, making sunlight sparse. There is also an Edge variant which transitions the jungle to other biomes. The music has a lot of drums and exotic wind instruments and sounds "jungle-y." Desert (M): a bumpy land land of sand with lots of cacti, including the new prickly pear, occasional palo verde trees, and dead bushes. Only undead spawn here, and with high graphical settings, there is also a heat distortion effect on objects at a distance. The surface underground is primarily sandstone, with some occasional sand and stone deposits. The music uses a mix of sitar, drums and piano. Savanna (M): flat, grassy land broken up by the occasional acacia tree. The mega variant, is by contrast, extremely hilly. The surface underground is the same as the Plains, and it uses the Plains music as well. Mesa (M): a canyon consisting of different colored terracotta blocks. The Mega variant has huge spikes of terracotta, similar to the current Bryce Mesa biome. There is also an "F" variant which has grass blocks and foliage on the top. The surface underground continues to feature layers of terracotta, and the biome uses a calmer version of the desert music. Plateau (M): large, flat expanses of land abruptly jutting out of the surrounding land. There are grass and acacia trees on top, and the surface underground and music is the same as the Plains. Volcano (M): a lifeless wasteland with a central volcano. The ground is covered in basalt, a black dirt-like block that falls like sand. The surface underground is largely obsidian and contains a lot of lava lakes; however there is a lot of ore to find here, including diamonds. There is an ambient fog here, similar to the swamp biome, though you can see the glow of lava beyond the fog. This biome uses the Desert music. Oceans all use the same music, which consists of a guitar, steel drums, and piano. When there is an enemy nearby, the guitar and steel drums drop off, and a bass track is added, sounding like the famous "Dun Dun Dun Dun" music from Jaws. The exception is the frozen ocean, which is the same music, but played with bells and violins instead. The surface underground is the same as Plains, but many portions will be flooded. They all come with a deep variant, where the sea floor is at the bottom of the surface, or y=0. Warm Ocean: has a floor of sand and generates seagrass, kelp, coral, and sea cucumbers. Appears adjacent to warm and hot biomes. Lukewarm Ocean: has a floor of sand and clay and generates seagrass and kelp, and occasionally sea cucumbers. Appears adjacent to warm biomes. Plain Ocean: has a floor of gravel and sand and generates seagrass and kelp. Appears adjacent to any biome. Cold Ocean: has a floor of gravel and generates kelp. Appears adjacent to warm and cold biomes. Frozen ocean: has a floor of gravel and generates kelp. The surface of the water is ice, which occasionally juts upwards as an iceberg. Appears adjacent to cold biomes. Mushroom Island: an island made up of mushrooms and mycellium (which is now a full block), and is the only place mooshrooms spawn. The surface underground is also made up almost entirely of mycellium, occasionally broken up by ore. No enemies spawn here; however, this is not a very livable biome as all blocks placed by the player will turn into mycellium after 30 seconds. A "funky" version of the ocean music plays here. Archipelago: an assortment of small islands, which can have an acacia tree spawn on them in the shape of a palm tree. Occasionally you can find a buried chest under an X made of dirt in the otherwise fully sand island. Atoll: an island made of coral blocks in a circle. Volcanic island: a smaller versions of the volcano biome that appears in the middle of the ocean. Empty sky: Nothing to see here, folks. Floating island: A rare, massive, floating landmass containing grass and aether trees. Other than that, it's a regular Plains biome in the sky, though the volume of the music is reduced with height. These biomes can spawn in any region, and unless otherwise specified, use the music and surface underground of the surrounding biome. Cold Beach: Stone cliffs dropping off into an ocean. River: a tract of water often used to separate to large biomes. Gravel Beach: a beach made of gravel, appearing where oceans border taiga and extreme hills. Mountain Range: Absurdly high and thick mountains that are difficult to traverse. You can try to tunnel through them or build paths up them, or ignore setting up convenient methods and just climb it. Uses the Extreme Hills music. Ravine: a crack going deep into the earth. Wither Breach: A desolate gray wasteland with giant bones jutting out of the ground. The entire biome is made up of ash, with no ores to find. There is no music, just an ambient wind track. There is also a deep ambient fog, and going into this biome without the proper protection will cause you to take 5 wither damage per second. There are many buildings that can appear within the game. Note that when I say something like a "chair" or a "table," I mean an approximation of it made with other blocks, such as using stairs for chairs and fence posts and slabs/pressure plates for tables. Village: Villages return, and are a bit more of a bustling metropolis than they currently are. Villages can spawn in Plains, Ice Plains, Deserts, Savannas, and occasionally on floating islands. When a village spawns, it will spawn with a village totem in the center. Then, there will be four posts on the corners of the village, and a wooden fence connecting them all. This means that the village will have a rudimentary level of protection, though it won't protect against everything. The posts determine the size of the village, and you can move them if you want; however, the two opposing corners closest to the center of the village will determine the area of the village. Thus, you'll have to move at least two of the posts to expand the village. The posts can be up to 512 blocks apart from each other on the x and z axes, and up to 64 blocks apart on the y axis, and they can be half that distance from the village totem. I'm terrible at explaining things, so this next spoiler should make it a bit clearer. So, imagine that P=valid post, I=invalid (unregistered) post, and T=the village totem. - and | are the generated fences. This is how the initial village fence might spawn. But, let's say you want to expand the village, so you move one of the posts. Even though you moved a post, the game isn't recognizing it, as the village looks for the two closest posts. In this case, the top-left and bottom-right posts are determining the size of the village. So, you move the bottom-right one. Now, the village is a little bit bigger, as the village is looking for the two closest opposing posts. However, if you want to maximize your space, you should move at least three of the posts and put them in a rectangular formation. It would probably also be a good idea to expand the fence/wall. If there are fewer than two posts, the village will be considered 32 blocks wide. You can purchase blueprints for a village totem and boundary posts from a librarian once you've maxed out its disposition (more on that in a bit). There will be several different buildings, each of which will spawn a corresponding villager or villagers. Hut: a small, single room building containing a bed, and a ladder to the roof containing a basic crafting table. Spawns a random villager. Small House: a two-room building with a table and some bookshelves in the entry room, and a bed and a basic crafting table in the second room. Spawns a random villager. Large House: a three-room, L-shaped building with the corner room being the entry. The entry room contains two tables and some bookshelves. The second room is a bedroom with two beds and a basic crafting table and a low value chest. The third room is a barn, containing two random animals, and opening up to the remaining corner, which is a small courtyard. Spawns a farmer and a random villages. Butcher's Shop: a medium-sized, single room building with a stone slab table, a pen in one corner containing a pig, and a bed and basic crafting table in another. Spawns a butcher. Library: a two-story, thin building with a bunch of bookshelves on the bottom floor, and a bed, table, and basic crafting table, as well as a low quality chest on the second. Spawns a librarian. Garden: a square 5x5 patch of land with a single block of water in the center, and some random plants, including flowers, planted in the surrounding dirt. It is surrounded by a fence. Farm: a 5*12 patch of farmland with a stream of water in the middle. Only grows edible plants, and is cultivated by farmers. Blacksmith: a stone, two-room building with a couple of lava blocks and an anvil, furnace, and a slightly valuable chest inside the entry room, and a bed, basic crafting table, armor stand, and an item frame with a random low-tier weapon in it. Spawns a blacksmith. Church: a stone, single-room building with a bell tower connected to it. The main building has three rows of wooden chairs and a lectern, and the bell tower is mostly bare, with the second floor containing a bed, and the third floor containing a bell that makes a loud clang when struck with a weapon. Spawns a priest. Bank: a two-room stone building separated into the entry lobby and the vault. The lobby has two tables with chairs. The vault is surrounded by obsidian and has a high value chest inside, but looting it will cause your popularity with the village to plummet, causing the town's golems to attack you. Right outside the vault is a small bedroom for the banker, containing a bed. Spawns a banker. Hovel: a dirt version of the hut, with no windows or rooftop. Spawns a nitwit. Tavern: a large, two-story building, with a large lounge with tables and chairs on the bottom floor, and several unoccupied bedrooms on the second. This is the rarest building and only spawns in large villages. During the evening, all villagers besides priests will socialize here before returning to their houses at nightfall. This building spawns a butcher and a farmer. Its bottom floor blocks are within the confines of an existing village. The building can have up to two floors. Each floor needs to have at least 12 air blocks. The floor needs to be completely enclosed in solid blocks, including partial blocks like doors, stairs, and glass panes (because of this, generated buildings with multiple rooms don't have doors between rooms, just doorways). The walls need to be three blocks high, though a roof is not required. A nearly full roof (80%) is needed to register a second floor. The building can't be larger than 32 blocks wide. There is at least one door in the wall, and a bed somewhere within the building. All villagers will initially spawn inside their assigned building, while golems will spawn next to the village totem. Since I'm talking about villages, it'd probably be a good time to discuss the new trading system. The new villagers will be discussed in the creatures section. Like potions, I never really liked villager trading. It took too long to get anything good, and it was just faster for me to find the stuff myself (provided the world generation RNG didn't hate me). However, randomness is such an integral part of villager trading, so I don't think it should be completely removed. Instead, I'll make it easier to get to the offers you want. 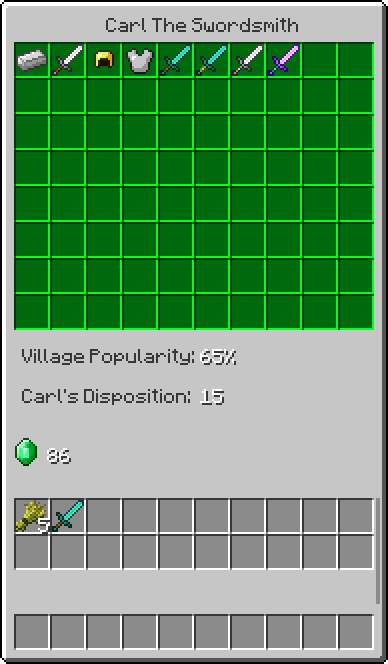 The villager GUI is split into two grids. The bottom grid is your inventory, while the top grid is the villager's inventory. Between the two grids is a small interface displaying your popularity in the village, that particular villager's disposition towards you, and your emeralds. Hovering over an item will display its buy/sell cost. To trade, grab the item you want to trade and simply place it into your inventory. If you are buying an item, you will grab one unit at a time. Holding shift will grab a whole stack, or as much as you can buy. Grabbing the item will immediately deduct emeralds from your inventory. When selling, the item will remain in the villager's inventory for you to buy back until you leave the trading GUI, after which generic items will disappear. The last three items you've named will remain available for buyback indefinitely. As you buy and sell items, your disposition with that villager will rise. As it does, that villager's inventory will increase to include more items. Eventually, the villager's disposition will reach 100, and continuing to trade with it will replace lower-quality stock with higher-quality stock. Villagers will buy anything you want to sell, but they'll offer better prices for items of their profession and if they like you more. Your popularity determines how much that village likes you. It starts at 50% and increases as you perform trades, and decreases as you do negative tasks such as killing a villager or golem, breaking a generated block, or stealing from a chest. With higher popularity, villagers will provide you discounts and occasionally even offer you a free gift. With lower popularity, golems will attack you and villagers will give you worse prices. Rarely, villages will spawn as zombie villages. All the houses will spawn as ruined variants, missing several blocks and mostly empty of loot. At night, zombie villagers will spawn within the confines of the village. Destroying the village totem will cause a bunch of zombies to spawn immediately, but will also prevent the area from being considered a village anymore. Cabin: A one-room building. about the size of two village huts. It has a crafting table, a decent chest, and a bed, as well as a pen out back. It spawns a single non-banker villager, who will probably not survive very long without protection. These can spawn in any biome. Temples: There are different types of temples for different biomes. The Jungle and Desert Temples return, and there is a new temple for the Ice Plains and Swampland. Jungle: Split into three floors, with the top floor being on the surface. The top floor is mostly empty aside from a skeleton spawner and a staircase leading down. The middle floor has a tripwire which, when triggered, will cause some dispensers to shoot tipped arrows of poison at you. In some indentations in the wall are some chests with some low-tier loot. The bottom floor is hidden and can be accessed by pressing a hidden button which opens a path to a staircase (or mining your way through if you're boring). Down here are two skeleton spawners and a trapped chest, which, if opened, gives you five seconds to grab everything and run before some TNT blows you up, which is connected to the chest by a redstone delayer. Desert: The desert temple is a massive pyramid with a tower at each corner. There are two floors. The first is a randomly generated maze. The second floor can be accessed from the center of the pyramid and is hollow. There are four husk spawners and a single chest containing decent loot. The four towers are connected to the maze and can be ascended via a ladder within them. They each have a low-quality chest and husk spawner within them. Frozen (Ice Plains): The frozen temple is a tower made of packed ice. It consists of four floors, each containing a spawner and a chest. The chests go from low-quality to decent as you ascend. The first floor has a skeleton spawner, the second a spider spawner, the third a stray spawner, and the fourth floor has two stray spawners. Swamp: The swamp temple consists of two floors. The top floor is on the surface level. It is mostly devoid of anything of interest, aside from vines and lilypads. The bottom floor is connected to the top via a tube of water. The floor has a witch spawner, and a decent-quality chest. Witch Hut: A small wooden house on stilts. Witches will often spawn here. Inside is a bed, basic brewing stand, crafting table, and chest containing some potion ingredients. House: A shelter for the builders of old. They'll often spawn with an empty chest, though occasionally the chest can have food inside. There are three variants, including a one-room ruined cabin, a four-room, two-story empty house, and a one-room building connected to a short tower. These buildings are all missing several blocks, meaning that you'll need to fill in the gaps if you want to live in them safely. Abandoned Farm: A plot of farmland out in the middle of nowhere, identical in appearance to a village farm. Most of the plants are gone, but a couple have survived. Tower: A stone watchtower built for picking off mobs from a distance and getting that Sniper Duel achievement. Graveyard: A flat area with several graves made of coarse dirt and a headstone made of a stone block. A couple of graves can have a chest under the headstone which contain bones, rotten flesh, and occasionally a gold nugget or emerald. Statue: A stone statue of one of the builders of old, because he apparently needed them to remind him how great he was. The statue is made of several smooth stone blocks, and there are a couple of different poses available. It's about 7x14x7 blocks in size. It can occasionally have a chest hidden under it containing decent loot. Ocean Ruins: Stone buildings found in oceans that have decayed over time. There are also shipwrecks that are the sunken husks of great boats. Dungeons are structures that consist of buildings with a mostly randomly generated layout. They have a lot of enemies, loot, and a unique final boss. Most dungeons are required to progress through the game, though some are optional and can provide you items that will help you tackle the main dungeons. The required dungeons are separated into five sets. The dungeons within each set can be approached in any order, but you must complete each set before you'll be able to access the next. Each dungeon has its own music, and bosses, for the most part, use a remix of the dungeon's music as their theme. Ruined Monument: The old Ocean monument has returned, but after such a long time, it has fallen victim to decay. The layout is roughly the same as the current monuments, but there a lot of holes and caved-in sections. It is occupied by Guardians. There is one boss, the Ancient Guardian, in the center of the monument, where the (now empty) treasure room used to be. Defeating the Ancient Guardian will cause the Guardian boss chest to spawn, which can contain Tier IV ingots and gems, 8-16 emeralds, and the bow Jet Stream. The music is calm, but eerie, using diminished chords with the guitar and piano to create an unsettling atmosphere. Basic Encounter: an empty room containing two vindicators, and a chest containing food. Stairwell: a room with a staircase leading up to the next floor. These rooms contain two vindicators and a Evoker. One stairwell will always generate per floor and will never generate on top of another. Dark Lab: a room locked with iron doors, requiring either breaking blocks or using a button/lever to access. This room can only occur once per Keep. This has a mini boss, the Experiment. Defeating it will grant you a small onyx enchantment gem, which will be useful later when you start to combat the wither. There is also a chest here containing Tier III ingots, and rarely a random small enchantment gem. Lounge: a room with tables and chairs. Spawns two Vindicators. Observation room: a room with two rows of chairs combined in an L fashion, looking out through a hole in the tree's trunk. There is also a small deck with rails leading out of this hole. This will not spawn on the first floor. Spawns a Vindicator and a Evoker. Map room: a room with a desk, a chair, and a level 1 map of the immediate area in an item frame. Since this map has already been activated, it can't be used to give you a minimap, but still provides a way to get your bearings if you don't already have a compass and a minimap yet. Spawns two vindicators. Barracks: a room with a bunch of beds. You're in for a fight with this one, as you'll encounter 6 Vindicators and 2 Evokers. There are also several chests in here, with can give you some partially-damaged Tier II and III weapons and armor. Nature Lab: a room with a dirt floor containing several decorative potted plants. Of particular interest are three oak trees that have twisted trunks and no leaves. Contains a single vindicator and a chest containing two small stacks of random farm plant seeds. The very top floor is an arena with an open roof (so you could theoretically just build or climb your way to the top without ever having to actually go into the dungeon). Here is an Illusioner, the boss of the dungeon. Once defeated, its boss chest will spawn, containing some Tier III and IV ingots, 16-24 emeralds, the Fist of the Evoker, and Frozen Flint. As the Keep of the Illusioner is required to beat the game, and is also one of the first dungeons you are supposed to visit, it is much easier to find, and the enemies within aren't as tough as their current incarnations. The Keep can be found within any forest-type biome, regardless of temperature, with the exception of jungles and swamps. They'll appear roughly once per twenty forests. Also, because it's an early-game dungeon, most of the unspecified loot is just food with some occasional Tier II and III ingots and equipment thrown in. The music is a remix of parts of "Clark" (Calm 2), but sped up and with more minor chords, and new parts that are played with the organ. There are two more dungeons in set 1, but those are underground and will be discussed in the next suggestion in this series. Pirate Galleon: a stationary ship randomly encountered on the ocean. There are three decks, each occupied by various Swashbucklers. The bottom deck is the cargo bay, where you can find some gold nuggets and equipment, as well as emeralds in chests. The middle deck is the living quarters, where you'll mostly find food and Tier III equipment. On the top deck are most of the Swashbucklers and an entrance to the Captain's quarters. The Captain's quarters contains the Captain, the boss of the Galleon. His boss chest can contain various pieces of gold and emerald equipment, 16-32 emeralds, and a basic crossbow. The music is played with an accordion and piano, and is reminiscent of sea shanties, like "Blow the Man Down". Arena: a large, circular coliseum that is initially empty, which can spawn in deserts. On both sides is an open gate. In the center is a unique, indestructible "Arena Activator Block" and a sign saying to strike the block with any weapon to prove your worth. Upon doing so, the arena will repair itself and destroy any player-placed blocks, and waves of enemies will spawn. While a wave is in progress, the player will be unable to place or break blocks, and somehow ending up outside of the arena will end the wave without any reward. The gates will also be closed by iron bars. Weather will also seem to be paused and set back to normal on the client's side. Undead spawned during waves are unaffected by sunlight. Upon clearing a wave, you can either strike the block again to move on to the next, or you can leave through the gates, which open between waves. Your rewards spawn in a chest above the Activator. Leaving (or dying) will return the arena to the state it was in before, including placed blocks and any destroyed segments, and will despawn all enemies spawned by the arena. Waves: The enemies and the numbers of each as well as the quantity of your rewards are effected by your difficulty when you strike the Activator. Your difficulty is locked for the duration of the arena battle. Only one player can attempt the arena at a time, and only once per in-game day. If wave 10 is cleared, then the player will have to wait 7 in-game days before being able to attempt the arena again, after which the standard once per day rule applies. If other players are in the arena, they will be teleported to one of the gates, from where they can go to the seats and watch. None of their weapons will have any effect on the enemies or the player. Attempting to jump back in will teleport them out again. They also cannot place or break blocks within the confines of the arena. The music for the arena only kicks in when a wave is in play. It starts out with just a bass drum track, but with each wave a new track is added, including more drums, a cello, piano, and choral "ahhs," eventually ending up with a very epic theme by the time you reach the Grand Champion. Wither Crater and Tower: This is the only dungeon in dungeon set 3, and is required to gain access to Petrinac, one of the new dimensions. Wither Craters spawn in the middle of Breaches, and have the appearance of a giant indentation into the ground in the shape of an upside-down dome. In this crater, several rib-like bone structures jut out of the ground, and if you were to excavate, you would find that these all join into one structure at the center of the crater. The crater is occupied by Wither Skeletons and Hopping Skulls. At the center of the crater is a thin, but tall tower made from bone blocks. The tower's first floor is actually a small distance (about 16 blocks) from the ground, and is connected to the underground bone structure by three pillars. The only entrance is a hole in the bottom of the first floor. Attempting to approach the tower from above the first floor will cause you to be repelled by an invisible force field. The tower is split into six floors, plus a rooftop arena. 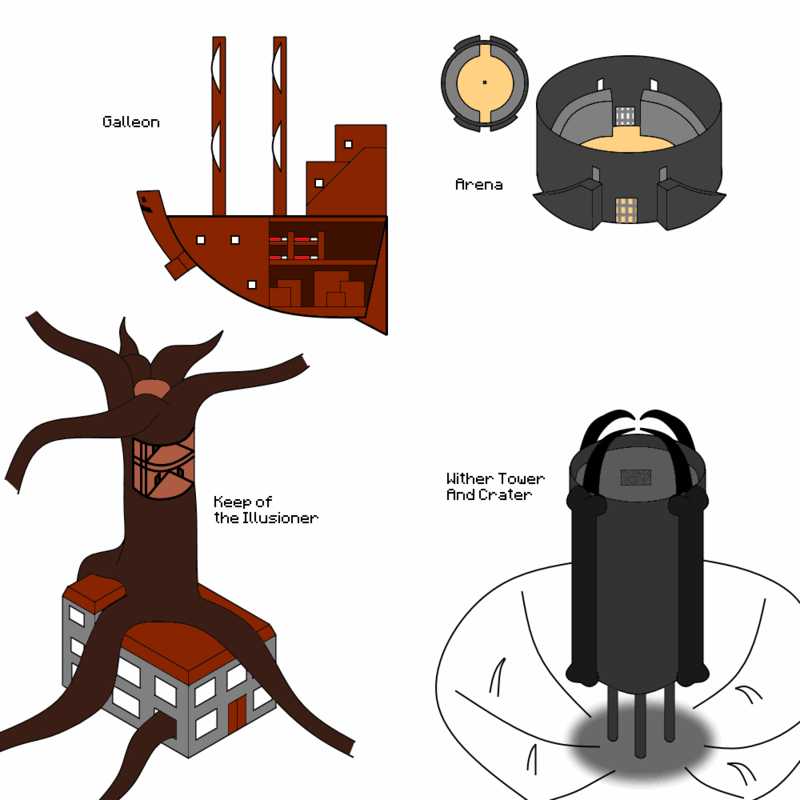 The order of four of the floors can be randomized, but the tower will always contain the same floors. There are four places a staircase can generate, one in each corner of the tower, and staircases will not generate on top of another. While each floor only consists of one room, the tower is pretty wide and has quite some distance between staircases. Entry: This room is always the bottom floor. It's empty, so you can regroup after fighting your way in. There is a chest containing some food and Tier VI ingots. Grinder Room: This floor has several sets of spike blocks covering most of the floor. These alternate, and there are safe gaps. This floor spawns a bunch of Wither Skeletons and Bumper Bones. Spawner Room: This room has several pillars, several of which are hiding a Wither Skeleton spawner. There is also a chest in two of them, with one containing Tier VI ingots and the other containing Potions of Purity. Rift Core: This room has a Rift Core in the center, which much be defeated before you can gain access to the top floor. Attempting to attack the Rift Core causes it to spawn a Wither Skeleton every 15 seconds until it is destroyed or the player leaves. However, you don't need to start the fight immediately. Claustrophobia Room: This room is a maze with Wither Skeleton and Hopping Skull spawners in the wall. You can find chests with emeralds and the occasional Potion of Purity. Dark Room: This room is filled with a thicker version of the Breach's Wither Fog, making it even harder to see. This fog heals wither enemies, so you need to deal with them quickly. You can banish the fog by either filling in all the blocks with the fog and mining it, or using a bright light source, like lava or Sea Lanterns, which will destroy Wither Fog within three blocks of the light source. Roof: This room is an open-roof circular arena. The walls and floor are made of indestructible cortical blocks. The roof and entrance from the staircase are filled in with force field blocks, which disappear when the Rift Core is destroyed. Jutting up of the the walls are rib-like bone block structures, almost meeting at the center but leaving a bit of space. In the floor of the arena is a pool of Sludge. Here, you fight the Acolyte. Killing the Acolyte spawns its boss chest, turns the sludge into Petrinac Portal blocks, turns all the cortical blocks except those directly adjacent to the portal into normal bone blocks, and banishes the Wither Fog from the Breach and making it technically considered a Plains biome (none of the world is regenerated; the music just changes and normal mobs spawn). The Acolyte's boss chest contains a few Potions of Purity, a quantity of emeralds, some Tier VI ingots and random piece of equipment, and the trinket Might of Decay. The music only kicks in when you reach the tower, and consists of some fast paced music featuring organs and cellos. I honestly don't know how to describe it better than that, as designing music isn't exactly my strong suit. Expected Tier: The tier of equipment the player should have by the time they take on this enemy. Stats are balanced around that tier. HP and MaxHP: The mob's health, which is diminished by dealing damage. That's probably a given at this point. AP: Natural armor points, which can be further augmented by giving the mob armor. MR: Magic resistance, which determines the mob's chance at resisting a magical effect. This is normally low, being either 0-20, though some more powerful mobs can resist your magic with ease. KR: Knockback resistance, which reduces the amount the mob takes knockback. Player Relation: Can be Passive, Neutral, Hostile, Utility, Ambient, or Tamable. This determines how they will act towards players. Passive mobs will never attack the player. Neutral mobs will only attack the player when provoked, and will stop attacking the player when they get too far. Hostile mobs will always try to attack the player as long as they know the player exists. Utility mobs are mobs that can be created by the player and perform a specific purpose. Ambient mobs never hurt the player, die easily, and drop nothing of use, and have simple models and AI to minimize lag. Tamable mobs are mobs that can come under the control of a player through some action such as feeding them. XP:The amount of XP the mob drops via various actions, such as being killed or breeding. Pack Size: The number of mobs the game will try to spawn upon a successful spawn attempt. Since we don't have a prototype to test, stats are labeled with vague terms such as low, medium, or high, and are assumed balanced around the expected tier. If say a mob's HP is labeled medium, and it's expected tier is III, then you would be expected to have iron or equivalent equipment to deal with it. If you had stone (Tier II), the mob would have the equivalent of high HP relative to you. If you had diamond (Tier IV), you would find the mob to have low HP relative to you. Note that child mobs do not drop anything. These mobs will never attack you and usually drop useful items. A large bird that drops 1 raw chicken and 1-3 feathers when killed. Occasionally, it will lay an egg. It can spawn with either white, brown, or black plumage. It can be bred and led around with wheat seeds. A bovine that gives milk and drops 1-3 cow meat and 2-4 leather when killed. It can spawn with either the classic white on brown skin, or a black on white skin. It can be bred and led around with wheat. A variation of the cow, the mooshroom, spawns on mushroom islands. They have black eyes, a white on red skin, and mushrooms growing on their back, and they yield mushroom soup when milked, but are otherwise identical to cows. A small feline that populates jungles. They drop 1-2 fish and 0-2 leather. They are very skittish and will run from moving players, but they can be tamed with fish. A small pink animal that gives 2-4 porkchops and 1-3 leather when killed. It has the classic pink skin available, as well as a pink skin with brown spots. It can be bred and led around with carrots. A cute little critter that runs around aimlessly. It can jump very high and run very fast. If killed, it occasionally drops a unit of raw rabbit meat and/or leather, and rarely a Rabbit foot. It can naturally spawn with any of the 6 current skins, as well as the Bedrock white rabbit. It can be bred and led around with dandelions. A woolly animal that occasionally eats grass. Its wool has 3 levels of thickness, and it gains a level by eating grass. When sheared, it drops 2, 4, or 6 wool depending on its thickness. When killed, it drops 1 wool, 1-2 raw mutton, and 1-3 leather. The sheep can be dyed, but once sheared its wool will revert to its natural color. It can be bred and led around with wheat. A cephalopod that wanders aimlessly in the ocean. It drops 2-4 Ink Sacs. Librarian (White Robe): Spends most of its time inside buildings near bookshelves. Their specializations are Librarian (paper, books, compasses, name tags, and randomly generated written books) and Cartographer (maps, treasure maps, and explorer maps). Butcher (White Apron): Spends its morning in the Butcher's shop, then spends its afternoons socializing. It can hunt down and kill cows within the confines of the village. Their specializations are Butcher (various meats), Cook (various prepared foods), and leatherworker (leather and various leather armor). Nitwit (Green Robe): Spends its day socializing, but other villagers ignore it. Sells dirt, sticks, and rotten flesh. All villagers have a chance to sell something from another specialization when gaining a new trade in addition to what they would normally get. Villagers have 3 facial expressions: normal, happy, and angry. They have their normal face most of the time, but change to happy on a successful trade, and angry when hit. Nitwits look happy all the time. These sea creatures float around the ocean, staying near the surface. They will drown if forced to stay either above or below water for 5 minutes. These slow-moving critters spawn on beaches, where they move slowly and can lay eggs. They prefer to spend their time in the water, where they can more pretty fast. They don't drop very much, but they can occasionally drop their shell, which can be either used as a helmet to give 10 extra seconds of underwater breathing, or to give you a speed boost if held while swimming. These rare, reclusive mobs appear in any temperate or cold forest-type biome, or deserts. They drop 1-3 leather when killed. When encountered, they can occasionally lead their pursuer to buried treasure and sit on it. Most of the time, though, they'll just attempt to run away from the player. They can be bred and lead with raw meat. They will hunt chickens. They have three possible skins: a white arctic skin which they use in cold biomes and cold weather, a dusty yellow skin they use in deserts, and an orange skin. Clams are small mollusks that generate at the bottom of oceans. They don't move, but take a long time to kill due to their very high AP. When killed, they can occasionally drop a pearl. They come in three different sizes but are otherwise identical. These mobs won't attack unless provoked. Bears wander around aimlessly, looking for pigs, sheep, and cows to kill. They come in three variants. Polar bears spawn in Ice Plains. Grizzly bears (brown bears with an orange snout) and black bears spawn in any temperate forests. Grizzlies prefer to spend most of their time near rivers, chasing fish mobs. Black bears constrain their hunt to the woods. Occasionally, bears will spawn with a cub. They will only get hostile if a player attacks them or gets near their cub. They drop random fish and 2-5 leather. Wolves wander around forests, killing pigs, sheep, cows, and chickens. They drop 0-3 leather when killed. They, along with other members of their initial pack, turn hostile when attacked. They can be tamed by giving them a random amount of bones. They have 3 skins: a white "classic" skin, a brown skin, and a black and white "husky" skin. Deer are brown creatures with thin, long legs and a pair of antlers. They drop 2-4 leather when killed. If approached or attacked, they will attempt to ram the player. Children have no antlers. The Great Stag is a glowing white deer with turquoise eyes and yellow swirls through its coat. Its antlers are much larger than a typical deer as well. If approached or attacked, it will initially try to run away. Once the chase has gone on for a while, or it has lost half its health, it will start to ram the player. It is very fast and does a lot of damage and knockback when doing this. It drops 2-4 mystic leather when killed. These are simple mobs meant to add more life to the world. They all have 1 hp and drop nothing. Bats float around aimlessly in caves, annoying master cavers with their incessant squeaking. Fish float around any body of water. There are specific versions for cod, puffer fish, and salmon, as well as a generic fish mob with a randomly generated skin. They can be captured in buckets, but drop nothing if killed. Rats are typically found underground, but can appear above ground at night. They eat food items left on the ground. Frogs are found in swamps, or any temperate biome when it rains. They hop around, like rabbits. These are small, thin, and long creatures made of several blocks put together in a chain. They slither around aimlessly and ignore the player entirely. These mobs can be tamed and work for the player. They won't ever despawn, and once tamed they won't move without the player telling them to. Horses and Donkeys spawn in Plains and Savannas, while llamas spawn in Savannas and Extreme Hills. They are tamed by riding them. They will try to buck you off, but you can spam the jump button to try to stay on. Staying on longer will reduce the number of attempts you have to try, but you don't need to use the spamming method to tame them. Once they knock you off, they will try to run away, so you'll need to chase them or sneak up to them. Mules spawn as the offspring of a horse and a donkey. Horses can be saddled and ridden. Donkeys can be given chests to carry. Mules can be given larger chests to carry. Llamas can also be given chests, but have a lower capacity; however, they can be chained together with leads. They can all be bred and lead around with golden foods, and drop 2-4 leather. Parrots spawn in jungles where they fly around in a spectacular manner. They can be tamed with seeds. Once tamed, they will follow you around unless you order them to sit, and will land on your shoulder if you stand still. They will mimic the sound of nearby mobs, alerting the player. They will no longer die if fed a cookie; instead they'll simply refuse to eat them. I think the lesson's been learned by now, and I always thought it was kind of a dumb addition. Tamed versions of wolves. They can be ordered to follow you around and will fight enemies. If you throw a stick, they will bring it back to you. Tamed versions of ocelots. They will follow you around, scaring creepers. If you drop a wool block in its vicinity, it will play with it by knocking it around. Iron Golems protect villagers and whoever built them. While they don't follow the player around, they will kill hostile mobs nearby, and can be lead around with leads. At least one will spawn at every village totem, regardless of villager size, and another one will spawn for every four villagers in the village. More can be built by combining four blocks of iron in a T and placing a pumpkin on top. They drop iron ingots when killed. They attack by launching their enemies high in the air, which in it of itself does a small amount of damage, but mostly depends on fall damage. Snow Golems naturally spawn in Ice Plains villages, typically 1 per every 3 villagers. More can be built by putting a pumpkin on top of two snow blocks. They drop snowballs when killed. They attack by throwing snowballs at their enemies, which does no damage, but does put out fires and knocks them back. These guys attack you on sight. Beware! These are undead mobs that spawn in unsafe chunks (see part 5 for a summary of chunk safety). Undead mobs burn during the day if there is no solid blocks 32 blocks above them, and are damaged by healing effects, and healed by harming effects. They seek out the player, attempting to punch them. They can call out for help if attacked, and spawn more zombies nearby. They can also set the player on fire if they are burning themselves. They can sometimes spawn with a set of armor and a weapon, which start out at Tier III (iron), and the tier they can spawn at increases by 1 for every dungeon set that has been completed in the current world. They drop rotten flesh and can sometimes drop a piece of their armor or their weapon, in a damaged state. The zombie has a spawning animation in which it rises out of the block it spawns on. Villagers turn into Zombie Villagers when killed by a Zombie, and are identical in stats to a regular Zombie. They can be cured with a potion of purification. Husks spawn in deserts once dungeon set one has been completed, and have similar relative stats, but are rebalanced for Tier IV and drain your hunger and saturation on contact. Drowned are Zombies that spawn underwater or die by drowning. They have the same relative stats, but are rebalanced for Tier III. They are equipped with tridents, which they can drop. Skeletons are undead that spawn in unsafe chunks. They are equipped with bows, and like zombies, can spawn with armor (Tier II, leather, in this case) that improves as the world progresses. They have a similar spawning animation as well. They drop bones and arrows, as well as occasionally their equipment. Strays are Skeletons that spawn in Ice Plains once dungeon set one has been completed, and are rebalanced for Tier III. They shoot tipped arrows of slowness I. Above y=0, spiders are neutral initially and will only turn hostile if attacked, or if it is night out (underground, they are always hostile). When hostile, they will chase the target and attempt to lunge at it. If the target gets too far away, the spider will attempt to throw a strand of string at it and pull the target back. It must stand still for this, meaning a fleeing player can tell when it's about to attempt this. Spiders can also spawn with a resistance or speed effect randomly. Slimes spawn in Swamps at night, depending on the phase of the moon, with more spawns as the moon is fuller. They can spawn at different sizes, and their health and knockback resistance is determined by their size. The smallest is size 1, which does no damage and drops 0-2 slimeballs when killed. They can spawn in sizes of 2, 4, 8, and 16 on the surface. Underground spawns are limited to 2, 4, and 8, and only where space allows. When killed, a larger slime will split into 1-4 slimes of half the size. Guardians spawn in any ocean, killing random wildlife, but prioritizing players who intrude too deep in the water. They attack by shooting a beam from their eye, which starts as a reticule, but becomes a projectile after 5/3/2 seconds. Skilled players can combat them by shield-bashing their beams back at them. They drop random fish and 0-2 prismarine shards or crystals. Witches attack by throwing debuff and damaging potions at the player, and try to buff themselves up between shots. They can drop a random potion, a unit of nether wart, and some redstone. Vindicators spawn in random rooms in the Keep of the Illusioner. They do not despawn or ever respawn. They are armed with an axe and attempt to impale the player. They can drop 1-3 emeralds and occasionally their axe. Evokers are wizards who inhabit the Keep of the Illusioner. They can attack and defend themselve by summoning fangs out of the ground that snap at any players who get too close, and they can also summon a set of Vexes, who fly around and attempt to attack the player. A new spell is the ability to summon a fist in front of the Evoker, which after a second charges forward. While it does little damage, the fist pushes back the player, giving the Evoker some distance. Swashbucklers are illigers that inhabit Pirate Galleons and come in three types. The Deckhand has an iron sword and attempts basic melee attacks, but has a faster cooldown for its attacks than a player would. The Artilleryman has a basic crossbow. The Rogue has two daggers and quickly switches between stabbing the player and trying to make some distance between them. All Swashbucklers drop 1-3 gold nuggets or 1-2 emeralds and can drop their equipment. Sand Snakes are long, brown worms that rarely spawn in deserts. They can only move through sand blocks. They make no noise, but the sand that they are in produces particles regardless of graphical settings, which can be used to see where they are. They can only see mobs if they are walking on sand (because of this, villages in deserts have a sandstone floor across the entirety of it). They will attempt to lunge at players by jumping out of the sand, but they cannot change their trajectory mid-air. Since they are physically blind, they cannot tell if they are going to land back in a sand block, and if they don't, they will slither back to the sand they came out of. However, they are extremely vulnerable at this time. They can only be damaged outside of a sand block, or if the block they are in is destroyed, which hurts it for 20% of its health. They drop 1-3 Leather and rarely a fang. Wither Skeletons are tall, black skeletons wielding a sword. Their eyes and mouth are white and glow, similarly to the texture of the Wither's heads. Their sword is made of Withrust (Tier VI), and they can occasionally spawn with armor made of it as well. Like all wither enemies, they deal wither damage, increasing players' wither meters. They drop 0-3 ash, 1-2 coal, and occasionally 1-2 charred bones. Hopping Skulls are literally just the skulls of Wither Skeletons. Their model is split in two, making them appear to have a mouth. They can spawn on their own wherever a Wither Skeleton can, but they can also spawn with a 50% chance when a Wither Skeleton is killed. They attack by ramming the player. They drop 0-2 ash, 1-2 coal, and rarely a Wither Skull. These are indestructible entities that have the appearance of several long bones that are initially folded like a flower bud. When a player gets close, they unfold, knocking the player back, but doing no damage. They die when the tower's Acolyte is killed. I'll be perfectly honest, I believe the Creeper is an example of terrible game design, as it's a trollish mob that can insta-kill fully armored players and is the only mob in the Overworld who can cause griefing on a major scale. Its drop isn't even that useful, yet it doesn't burn or disappear immediately in sunlight, or even make any sounds. And, to make it worse, there are no restrictions on where this mob can spawn, beyond being in a dark place, meaning a creeper can be the first mob a player encounters. I remember some friends who were playing the game for the first time and were trying to build a house on the first night, that kept slowly building its own basement as they kept getting assaulted by Creepers. Really, I believe the Creeper only gets a pass because its a meme and iconic, not because it actually makes the game better in any meaningful way. However, as removing them would cause huge backlash (I mean, its face is in the title), Creepers do still spawn, but only underground initially, and can only rarely appear above ground once dungeon set one has been completed. Creepers explode near their target and drop 1-2 gunpowder. Unlike before, they actually make noise as they move, making them much less annoying. These baddies are tough and will try to stop your progress by any means necessary. They will only target players and will be reset should no player be nearby. They also cannot be transported far from their initial spawning location if spawned as a dungeon's boss. All bosses will grant the players who defeated them 25 additional maximum health the first time that player beat them. Phase 1: The Ancient Guardian will alternate between shooting beams and ramming the player. When shooting, it will form a reticule for 5/4/3 seconds, and then shoot a salvo of 3/4/5 beams, with half a second between each shot. Like a regular Guardian's beam, these can be shield-bashed back at the Ancient Guardian, which will interrupt the salvo. These beams can break all blocks besides prismarine and prismarine derivatives, but don't go very far. When ramming, the Ancient Guardian will back up for a bit, and then quickly ram in the direction of the target. If it hits a player or goes 16 blocks without hitting any blocks, the Ancient Guardian will stop and begin the next attack. If it hits a wall, it will be stunned for 5/3/1 second. It switches to the second phase at 60% health. Phase 2: The Ancient Guardian summons 2/4/8 regular Guardians to protect it. It then continues with more powerful versions of its Phase 1 attacks. It shoots twice as many beams with half the delay between them, and they have a bit of a random vector applied to them instead of always shooting directly at the player, meaning that simply continuing to move may not be enough to dodge. It also chains three rams in a row, and only the last ram can stun it, and only on easy and normal. On death, it turns black, its eye looks up, and it floats towards the surface, exploding. Once the explosions have finished, its boss chest spawns, which looks like prismarine with gold trimming and the Ancient Guardian's eye on the top. The Experiment is a Wither Skeleton the size of a regular Skeleton with Vindicator robes. It wields an iron ax and deals Wither damage. Phase 1: It charges at you with its ax, identically to a Vindicator. It switches to Phase 2 at 50% health. Phase 2: Starting this phase, the Experiment briefly hunches over, making it vulnerable. However, after a few seconds, it will quickly lean back, looking up and causing a small explosion that doesn't break blocks but deals both Wither and blast damage. During this explosion, it loses most of its robes, just leaving tatters, and he grows to three blocks tall. It plays the same way, but does more damage and moves faster. At 5% health, it changes to its final Phase. Phase 3: It collapses into a pile of bones on the floor appearing to be defeated. The glow from its eyes disappear. However, this glow returns, and the skull becomes a regular Hopping Skull (though it will die in just a couple of hits). Once fully dead, the whole Skeleton poofs away in a series of black clouds. Its boss chest is a black chest with some runes carved on it. The Illusioner is a magic-wielding illager wearing gold-trimmed blue robes and a tipped blue wizard hat. Phase 1: The Illusioner starts by splitting into five Illusioners, with only one being able to be damaged and shoot arrows. Upon hitting a fake one, it explodes, doing a little bit of blast damage and knocking back the player. When the main Illusioner is hit, all of its clones disappear harmlessly. As it takes damage and gets closer to Phase 2, it gets harder to distinguish the clones from the Illusioner, as they start shooting purple, harmless arrows and take a couple of extra hits to explode, and the Illusioner itself takes more hits to make its clones disappear. It shoots with a bow and arrow, which can be tipped with slowness or hunger on hard difficulty. When it has no clones available, it will try shooting either a blindness or a paranoia spell at the player. This takes 5/3/2 seconds to charge, during which it holds both its arms upwards. It changes to Phase 2 at 40% health. Phase 2: The Illusioner looks at the sky, and the sky turns black for all players in the immediate area. A black version of lightning appears and strikes the Illusioner, turning the blue in its robes black, its eyes glowing white, and making it more powerful, giving it full knockback resistance and high armor points. It does the same attacks as before, but the clones can actually damage you now and all of the Illusioner's attacks deal Wither damage instead of normal damage. It can also use a repel spell to knock back nearby players, making it harder to hit melee. When it stands still, instead of using the blindness or paranoia spells, it will call down black lightning on the player, though it will hit the position the player was when the Illusioner started casting rather than the actual position of the player, allowing the player to escape. When the Illusioner dies, it stretches out its arms, looks up, and then explodes in a large black cloud, leaving behind its boss chest, which is a blue chest with gold trimming and a black gem on the top. The Pirate Captain is an illager wearing gold-trimmed burgundy robes with a feathered cap, an eye patch, and a pegleg. Phase 1: The Pirate Captain will attempt to keep its distance from the player, shooting with two basic crossbows (something the player cannot do). It will rally nearby Swashbucklers, increasing their speed and damage. The Pirate Captain changes to Phase 2 at 60% health. Phase 2: The Pirate Captain puts away one crossbow and takes out an iron sword. It attacks with the crossbow when at a distance and uses the sword at melee range. Its melee attacks are extremely fast, making it difficult to get a hit in with a short-ranged weapon. Any remaining Swashbucklers are given a level II rally effect. The Pirate Captain cannot be knocked back by attacks, but parrying its attacks will knock it back a few blocks. If you can knock it off the boat, the Pirate Captain will instantly drown. When it dies out of the water, it will fall over backwards before poofing out of existence. In the water, it will thrash around wildly before sinking and then poofing. Its boss chest is solid gold with a single emerald gem on the cover. The Grand Champion is a giant, 6-block tall anthropomorphic skeletal lion, covered with unique (unobtainable) withrust armor and wielding a massive diamond sword in its right hand and an iron hammer in its left. Despite its tier, the Grand Champion is the hardest boss in the overworld. Phase 1: At melee range, it will favor its sword, but will follow up with a hammer attack if shield-bashed. Sometimes, it will hold its hammer back and then hit it on the ground, creating a damaging shockwave similar to the hammer's jump charge attack. The Grand Champion's armor makes it move very slowly, which means that you can keep your distance and shoot with a bow. However, arrows will bounce off its armor, meaning you can only damage it by hitting it in its face or unarmored areas. If you choose melee weapons, note that its high AP means that piercing damage is key. The Grand Champion can summon Husks, but will only do so if the player is too far to attack with melee attacks. Its armor, while durable, can be destroyed, especially with a pickaxe. While breaking its armor makes it easier to attack, it will move faster for each piece destroyed. At 50% health, it will move on to Phase 2. Phase 2: It will start by looking at the sky and roaring. This spawns eight husks at the edges of the arena. Then, it will throw its sword and hammer at the player, which will shatter on impact. Next, it will pull out a massive, unique Withrust greatsword, wielding it with both hands. It moves faster and is more hectic in its attacks, performing a combo of three slashes while sprinting towards the player. However, its large size means that it has difficulty changing direction during this and it needs a second to recover after stopping. If the player is far away, it will jump across the arena and stab its sword into the ground, creating a shockwave. Periodically, it will roar again, summoning 8 more husks. When it dies, it will roar as it sinks back into the ground. Its boss chest is made of stone, bearing gold designs and adorned with several gems. Because the Grand Champion is considered undead, it will take damage from healing effects, and be healed by damaging effects despite its full MR. However, it is immune to burning from sunlight. The Acolyte initially appears as a gray-robed figure, about the size of the player. Its face is shadowed so you can't see it, and it has its arms together like a villager. It will spawn on the opposite side of the arena from the stairs leading up to it. It will appear to be facing away from the player, on a per-client basis. When a player gets close, it will turn its head to face them, and the fight will begin. Phase 1: The Acolyte teleports into the air above the pool of sludge in the center of the arena and call down a lightning bolt to strike the pool. The sludge will start flashing white, slowly at first, but gradually speeding up. During this time you cannot damage the Acolyte, as it will dodge any attack. The Acolyte will summon Wither Skeletons and Hopping Skulls around the arena, which the player much deal with while for a while. Eventually, the sludge in the center will stop flashing and some particles will shoot out. The Acolyte will absorb these particles and then move on to Phase 2. Phase 2: The Acolyte teleports around the arena, stopping for 10/5/3 seconds after each teleportation to perform one of three spells. It can shoot a black projectile dealing moderate damage at the player, create a 5-block potion effect cloud for 30 seconds near the player that slows them, or summon a Hopping Skull next to it. If damaged, the Acolyte will teleport again immediately. If brought down to half health, the Acolyte will move on to Phase 3. Phase 3: The Acolyte teleports to the center of the sludge which slowly heals it. When damaged, it will teleport away, but try to return to the pool when approached. It will continue to use its three spells, but its shooting spell is a volley of three, its potion effect cloud deals low wither damage, and it summons two Wither Skeletons. When killed, the Acolyte will teleport to its position above the sludge pool, call down another lightning strike on itself, and then plunge down into the pool. An explosion will occur around the pool, not dealing any damage, but increasing the wither of any nearby players. The pool of sludge will then turn into a Petrinac portal, and the tower will no longer be protected. Its boss chest is gray, with lighter-gray bands and a black latch. Basic Blocks: Dirt, grass, podzol, mycellium, stone, andesite, granite, diorite, cobblestone, gravel, ice, packed ice, sand, red sand, sandstone, red sandstone, gravel, basalt, etc. These blocks make up the basic generation of the world. Some are used for crafting. Stone turns to cobblestone when mined, and andesite, granite and diorite can be crafted into cobblestone. Ice and packed Ice are slippery. Gravel, sand, red sand, and basalt are effected by gravity. Mycellium is a purple block that spreads to all other destructible blocks, turning them into mycellium. Mycellium cannot spread outside of a mushroom island biome or below y=0. Cobblestone can be used to make Tier II weapons and tools (but not armor) at either a crafting table or an anvil. It will only provide its trait if made at an anvil. This trait is "Shatter," which gives the item a chance to break instantly, but do a huge amount of damage when it does break (about twice the damage of a Tier VI weapon, and increases if the weapon is upgraded). The weapon can only shatter if below 30% durability, and gains a higher chance to shatter at lower durability. This is a linear chance, from 30% durability=0% chance to shatter, to 0% durability=100% chance to shatter. Cobblestone equipment has no sockets. Spruce: Tall pine trees, with reddish dark brown wood and dark green leaves. Their leaves stay green and full all year long. Oak: Trees with the highest variety in size. Vibrant leaves and bright wood. Birch: Tall, thin trees with light green leaves, and the lightest wood. Maple: Short trees with a wide crown. They have green leaves which turn orange in autumn and orange wood. Cherry: Medium trees with pink leaves and red wood. Dark Oak: Thick, medium trees with dark green leaves and very dark brown wood. Jungle: Extremely tall, thick trees with wide crowns. Vibrant leaves and greenish brown wood. Acacia: Tall trees with wide, sparce crowns. Dull leaves and dull orange wood. Crystal: Medium trees with thin crowns. White leaves and blue wood. Palo Verde: Medium trees with yellow leaves and green wood. Aether trees: Tall trees with purple leaves and wood. The wood in trees is separated into two blocks: Trunk blocks and branch blocks. These look identical and both drop logs when broken, but branches will generate leaves in spring. Leaves can drop saplings, which have a 33% chance to plant themselves when despawning. Wooden Planks can be made from any log, with a color derived from the source wood. If turned into sticks, they can be used to make Tier I weapons and tools at either a crafting table or an anvil. If made at an anvil, they provide the "Splinter" trait, which gives a chance to apply the "Splintered" status effect when damaging an unarmored foe. Wood equipment has no sockets. Sticks on their own act as one-use wooden swords with no trait, which can be useful if you haven't got the materials for a crafting table yet. As a fuel, all wood blocks have a low burn time, smelt speed, and quality. If logs are cooked in a furnace, they will turn into charcoal, which is identical to coal, but with slightly better quality. Liquids: Liquids flow from high ground to lower ground and can be traversed through, but slow the player. All liquids can be transported by a bucket. Water: The most common liquid, water is a blue liquid that makes up oceans and lakes. It does not apply any potion effects on the player and can be infinitely produced by having two water sources flow directly into the same block. Lava: Lava doesn't flow very far, and emits light and burns the player. If water comes into contact with flowing lava, it will form cobblestone, while lava sources will form obsidian. If used as a fuel, it will burn for a really long time, but has poor quality and smelt speed. Quicksand: Quicksand only flows two blocks and generates exclusively in deserts. If a mob gets caught in it, they cannot rise. The only way for the player to escape is to climb or tunnel their way out. Quicksand turns into water on contact with it, and glass blocks in contact with lava. Sludge: Sludge occurs mostly in Petrinac, but can also be found in Wither Breaches and Wither Towers. It greatly slows the player and increases their wither meter while in it. It doesn't flow very far, like lava. It forms an ash block when it comes into contact with any other liquid. Oil: Oil is a dark yellow liquid found underground. It is used in creating fuel for the furnace and some late-game recipes. It will create a small explosion when it comes into contact with fire, lava, or another explosion, so be careful around oil pools. It does not form any block when coming in contact with water or quicksand, but just stays separate. It flows as far as water. As a fuel, oil doesn't burn very long, but does smelt quickly and has moderate quality. Ores: Ores are no longer their own blocks. Instead, they are a property of naturally generated blocks, which means they can appear in stone, stone variants (including sandstone), gravel, and dirt, appearing as an overlay. When broken, a block containing ore will drop both its base block and a number of ore (usually one and occasionally two, but can be increased with Fortune). You need a pickaxe to get ore from hard blocks and a shovel to get ore from soft blocks. Any tier of pickaxe or shovel can be used to gather ore of any tier, but you will still want to upgrade it as ores get much harder to break deeper underground. Heavier equipment slows the user when equipped or wielded, but increases their KR. Only armor effects your magic resistance. Coal: Coal is a fuel used to power furnaces and make torches. It is the most common ore of the surface and does not need to be smelted to be used. It cannot be used to make equipment, but can be smelted with Iron to make Steel. As a fuel, it has a moderate burn time and quality, but a poor smelt speed. Gold: Gold is yellow-orange in appearance. It rarely appears at the surface. It is Tier I and not really meant to be used in making equipment. It has the "Flashy" trait, which causes it to emit sparkle particles and a low level of light. It is heavy but slightly increases your magic resistance. Gold equipment has two sockets. Iron: Iron has a brown appearance as an ore but turns dark gray when smelted. It is very common at the surface. It is Tier III and has the "Rust" trait, which makes it incredibly durable outside of water but lose durability much faster when exposed to it. Its also heavy and greatly lowers your magic resistance. Iron equipment has one socket. Steel: Steel is an alloy formed by smelting iron and coal together. It looks like light gray ingots, similar to the current iron. It is Tier IV and has the "Tough as Nails" trait, which causes equipment to never break, instead just having 40% effectiveness at 0 durability. Its slightly less heavy than iron and greatly lowers your magic resistance. Steel equipment has two sockets. Redstone: Redstone is a glowing red ore that can be used to power and connect machinery. It is common deep underground, but an occasional deposit can be found on the surface. It can't be used to craft equipment, but it can be combined with iron to produce red bronze. Red Bronze: Red bronze is an alloy made by combining iron and redstone. It is dull red in appearance, and is considered Tier IV. It has the "Electric" trait, which gives the player a chance to stun enemies and slow players when hitting them, up to a 12% chance (2% per piece of armor and weapon). It is only moderately heavy and somewhat increases your magic resistance. Equipment made with red bronze possesses two sockets. Withrust: Withrust is a black metal that spawns in Petrinac. It cannot be smelted on its own and must be formed as an alloy with wither skulls. It is Tier VI and has the "Decayed Synergy" trait, which causes weapons to receive twice the damage bonus and armor to receive a protection bones from the player's wither. It is moderately heavy and moderately lowers your magic resistance. Withrust equipment has two sockets. Gems: Gems appear as crystals jutting out of a block, rather than an ore in a block (so no more confusing redstone with rubies). All gems are mined with an iron pickaxe or better. 1-3 of them can drop from any block, and they do not need to be smelted into a usable form. They are also used to make enchantments. All of these gems can appear at any height, but nodes get larger the deeper you go. There is one for every dye color. Emerald: Emeralds are green irregular hexagons, being taller than they are wide. They are used mostly for trading. When used in enchanting, they provide the "Fancy" enchantment gem, causing the player to use more flashy animations (such as sometimes somersaulting through the air when jumping) and emit green particles, with more particles for higher levels of the effect. Diamond: Diamonds are light blue gems, appearing round and intricately cut. Diamonds are the only gems that can also be used to make armor. As armor, they are Tier IV and provide the "Tough" trait. On armor, this reduces the minimum damage the player can take by 1% per piece, and on weapons it adds 10% piercing damage. As an enchantment gem, they give "Unbreaking," which increases the max durability of the enchanted item. Lapiz Lazuli: Lapiz is a rough blue gem that is used to make blue dye and apply enchantments to items. When used for an enchantment gem, it gives the "Luster" enchantment, which is purely cosmetic and increases the intensity of the glow effect on enchanted items. Nether Quartz: Nether Quartz is a sharded, off-white gem that is used to make advanced electrical machinery. It does not appear in the Overworld. On weapons, it gives the "Dispel" enchantment, which gives the weapon a chance to instantly remove a positive potion effect from the target. On tools, it applies "Silk Touch," allowing the extraction of blocks without breaking them. On armor, it applies "Mystic," which increases magic resistance. Ruby: A Ruby is an octagonal gem with a square indentation in the center. On weapons, it applies "Sharpness," which increases overall damage. On tools, it applies "Efficiency", increasing the speed of mining. On armor, it applies "Protection," which increases its AP. Carnelian: Carnelian is an orange gem with a vertical oval shape. On weapons, it applies "Fire Aspect," which burns targets hit by it. On armor, it applies "Fire Protection," which causes fire to do damage in less frequent bursts and thus less damage overall. Citrine: Citrine is shaped like a yellow square, beveled slightly. On all equipment, it applies "Supercharge," which increases the effectiveness of your weapon's charge and jump charge attacks. Olivine: Olivine is a light green circular gem. On non-tool weapons, it applies "Looting," which increases the likelihood of getting rare drops. On tools, it applies "Fortune," which increases the amount of ore and gems you get from mining them. On armor, it applies "Agile," which gives a small chance of completely avoiding damage from an attack. Ovaline can also be applied to fishing rods, give "Luck of the Sea," granting greater chances of getting treasures while fishing. Turquoise: Turquoise is cyan in color and shaped like a horizontal oval with a significant bevel. It has a higher chance to generate adjacent to water source blocks. On weapons, it applies "Aqua Affinity," which causes melee weapons to swing faster underwater, bows to shoot further underwater, and tools to mine faster underwater. On helmets, it applies "Respiration," which increases the maximum air of the wearer. On other armor, it applies "Depth Strider," which increases underwater speed. Amethyst: Amethyst is a deep purple gem shaped like a four-pointed star, and only generates at extreme depths. On weapons, it applies "Vitality," which causes attacks to restore a small amount of health. On armor, it applies "Thorns," which decreases the durability of the armor faster but causes attackers to take damage. Magentite*: Magentite is colored magenta and shaped like a regular hexagon. On all equipment, it applies "Lure." On most equipment, this slightly increases damage and durability but also increases enemy spawn rate. On a fishing rod, it increases fishing rate. Beryl: Beryl is a pink gem shaped like a triangle. On most weapons and equipment, it applies "Mending," which causes the item to take some of the XP you gain and turn it into durability. On bows, it applies "Infinity," which grants infinite ammo, but lowers damage by 25%. Agate: Agate is a gemstone shaped like a brown pentagon. It does not appear in the Overworld. On weapons, it applies "Disintegrate," which causes the weapon to deal blast damage, which breaks armor quickly. On armor, it applies "Blast Protection," which reduces the effect of blast damage. Pearl: A pearl is not a naturally generated gem, but is dropped from clams. On weapons, it applies "Smite," which does extra damage to wither enemies and reduces the amount of wither their damage inflicts. On armor, it applies "Cleanse," which slowly decreases your wither over time. Moonstone: Moonstone is a dark gray gem with a blue tint which is shaped like an eight-pointed star. On weapons, it applies "Knockback," which does extra knockback. On boots, it applies "Feather Falling," which reduces falling damage. On other armor, it applies "Steadfast," which increases knockback resistance. Onyx: Onyx is a black gem shaped like a square rotated 45°. On weapons, it applies "Decaying Strength," which increases its durability and damage based on the player's wither. On armor, it applies "Decaying Fortitude," which increases the speed of your health regeneration but also slowly increases your wither. *I'm not big on geology, so I can't think of or find a good magenta gemstone. If anyone can, I'd appreciate a better name. Leather: Leather drops from most animals and is used to create Tier II armor. It has the "Lightweight" trait, which means it slightly increases the movement speed of the wearer. It has no weight and slightly increases your magic resistance. Leather equipment has one socket. Mystic Leather: Mystic leather is white leather with yellow swirls in it and is used to make Tier IV armor. It has the "Magical Absorption" trait, which lowers the magic resistance of nearby mobs. It has no weight and moderately increases your magic resistance. Mystic leather equipment has two sockets. Food: There are various food items, which serve to fill a player's hunger. There are three main types of food: meat, crops, and cuisine. Meat provides a lot of hunger some saturation, but must be cooked or it will have a chance to cause the "hunger" effect. Crops can be eaten raw, and provide little hunger but a lot of saturation. Cuisine is the result of preparing food, and restores health in addition to a significant boost in hunger and saturation. While food does not go bad, it gets less effective the more often it is eaten, which is displayed by a durability bar under it. I won't go into the specifics of food unless it's new to Minecraft 2. Prickly Pear: Prickly pear is a pink, thorny fruit that can grow from prickly pear cacti in deserts. It doesn't restore a lot of hunger or saturation, but is the only crop available in the desert. Familiar Sack: This sack is sold by Pawnbrokers after you die and have left your items to despawn, and contains all those items. The cost of the Sack is equal to the combined value of the items, plus a 25% upcharge. Snow: Snow spawns in layers in Cold biomes, and on any block with no other block 32 blocks above it during a snow storm. Up to eight layers of snow can exist in a single block, and walking through snow slows all mobs by 20%. Dyes and Paint: Dyes still mostly come from flowers, with a few exceptions being cactus green, bone Meal, Lapiz Lazuli, and Ink Sacs. Dyes can be combined with water buckets to make buckets of paint, which have 256 uses each, and can tint any block in four different strengths. Wool: Wool is used to make items requiring cloth, such as beds. Fang: Fangs are rarely dropped by Sand Snakes and can be equipped as a trinket to slightly increase damage and speed. Charred Bones and Wither Skulls: Four charred bones can be crafted into a Wither Skull. Wither Skulls are required to form Withrust. A single charred bone can also be equipped as a trinket to slightly increase resistance to wither damage, and a Wither Skull can be worn as a helmet for a greater version of the effect. Spike Blocks: These blocks push out and retract a spike, damaging the player. They can be set in all six orientations. Ash: Ash is generally junk, but it can be used to form ash blocks, a decorative gray block which is affected by gravity. Chests: There are the standard wooden chests and trapped chests, but there are also boss chests. Boss chests more difficult to pick up than a regular chest and appear whenever a boss is killed, in a pre-set location dependent on where they initially spawned. They have a unique design for each boss, acting as a trophy. Clock: Clocks show a dial giving the approximate time of day and an icon showing the current season. Mousing over it in your inventory will show even more information in the tooltip, such as the exact in-game minute and how many days into the current season you are. Frozen Flint: Frozen Flint is used to make a cryonic fire starter, which is used to access the second dungeon set. Trident: Tridents are three-pronged, Tier III spears which can be thrown by pressing the drop button while charging them. They have one socket each, and are repaired with steel. Excommunicator: This sword of legend has a gold hilt with a white gem in the cross guard. It is Tier V, comes pre-enchanted with Smite, and has two sockets. It is repaired with steel. Jet Stream: This is a Tier IV blue bow that shoots arrows which go three times as far underwater. It has two sockets, and is repaired with Prismarine Shards. Fist of the Evoker: While technically armor, the Fist of the Evoker is a Tier III glove that is meant to be used offensively. Charging and releasing an unarmed attack will shoot an Evoker fist towards the crosshair, but will also damage the gloves. It has one socket and is repaired with leather. Basic crossbow: Crossbows act as semi-automatic bows which reload themselves between shots, and thus can be shot instantly. They have poor range but high damage. The Tier III basic crossbow can hold one arrow at a time, reloads slowly, has one socket, and can be repaired with wood. Champion's Belt: This oversized belt shows that you are the new Grand Champion of the Arena. It also increases the amount of XP you gain from kills. Might of Decay: This is an amulet which makes you weaker to wither damage but also get an increased damage benefit from your wither. If I forgot to mention an item that you're curious about, let me know and I'll add a section about it. Minecraft 2 would feature four distinct seasons, being spring, summer, autumn, and winter. Each season is 10 in-game days long (3 1/3 real hours long), and you can see what season is by looking at a clock. Only Temperate biomes are affected by seasons. The game always starts spring 1st. In spring, the player will only have to worry about mild weather and all chunks, above and below ground, have +10 safety. Grass blocks will attempt to generate new grass and flowers, tree will generate new leaves, and the game will try to spawn more passive mobs. Greens in plants look even greener, and crops grow 33% faster. The weather is still mostly mild, but there is an occasional thunderstorm. This season does not effect chunk safety or crop growth. Baby animals will grow up faster in this season. Plants are more vibrant in their colors, with a little more yellow, and buzzing sounds can be heard as part of Temperate ambient tracks. Weather starts to get more severe, with wind and dust storms occurring from time to time, and rain being less frequent. Crops grow 33% slower, but harvests are larger. Leaves and grass will start to turn brown, and leaves will also begin to decay. Weather is the most severe, with snow storms and blizzards happening frequently. Grass blocks turn white and snowy, while most grass, flowers, and leaves will quickly decay (player-placed plants last forever). Wolves are far more aggressive, able to seek out prey from much further away. All bears (even Polar Bears) will go "into hibernation" by despawning and will respawn the following spring. Crops grow 50% slower, and won't grow at all unless within three blocks of a heat source, such as a torch or fire block. Be careful not to let the crops catch fire. Weather is determined per region type, rather than being global. Each type of weather is affected by wind speed and direction. Wind direction is global, while speed is per region. So, while every Temperate region will be raining at the same time, each Temperate region will have a different wind speed and thus a different angle for falling weather particles such as rain. Wind changes four times per day and is completely random. In addition, weather can apply a multiplier to the region's wind speed. Clear: Clear weather happens in all biomes and means nothing is happening. Drizzle: This is a light rain storm that causes the sky to become overcast but doesn't lower the intensity of sunlight or moonlight very much. Farmland without a block up to 32 blocks above it will be hydrated. Drizzles occur in Cold biomes and Temperate biomes, mostly in spring. Rain: This is similar to the current rain. The sky is darker than a drizzle and surface chunk safety is reduced by 10. Fires without an obstruction up to 32 blocks above them will be put out, and crops will be hydrated. Rain occurs in Cold, Temperate, Ocean, and Sky biomes, throughout the spring and summer. Thunderstorm: The sky becomes very dark and lightning can spawn, causing short-lived fires. Chunk safety is reduced by 25. Fires will be extinguished and crops will be hydrated. Thunderstorm can occur in any biome, mostly in summer. In Hot biomes, they only occur in summer, and are much rarer and longer than in other biomes. Wind Storm: The wind picks up severely, pushing mobs in the direction in blows. Wind storms occur in Temperate, Hot, and Sky biomes during autumn. In Oceans, they can occur at any time of the year are very helpful in moving boats. Dust Storm: Dust storms are just like wind storms, but they also add an ambient fog, similar to the volcano's fog, making it hard to see. They only occur occasionally in autumn in Temperate or Hot biomes. Snow Storm: Snow falls from the sky, and piles on the ground. Exposed water turns into ice. Snow storms occur all year round in Cold biomes, and during the winter in Temperate biomes. Blizzard: Blizzards are like wind storms, but also pile snow on the ground, form ice in water, and cause lightning to strike. This occurs year-round in Cold biomes, and during the winter in Temperate biomes. Blizzards are much rarer than snow storms, only occurring with a fifth of the chance. Night Vision: Increases ambient lighting, making it easier to see in darkness. Mobs will get a higher detection radius instead. Made with a carrot. Invisibility: Makes the target translucent, making it harder for enemies to detect them. Made with materials from the fourth dimension. Fire Resistance: Makes the target take 33% less damage from fire and lava per level of the effect. Made with magma cream. Leaping: Makes the target jump a full block higher (buffed since you can now climb blocks). Made with a rabbit foot. Slowness: Makes the target move slower. Made with a block of ice. Swiftness: Makes the target move faster. Made with suger. Water Breathing: Makes the target able to breath underwater for 10 additional seconds per level of the effect. Made with a puffer fish. Healing: Restores the target's health slightly. Made with a gold nugget. Harming: Damages the target slightly. Made with a charred bone. Poison: Damages the target over time, down to 25%/10%/0% maximum health. Made with a spider eye. Regeneration: Restores the target's health over time. Made with a ghast's tear. Strength: Increases the damage and mining speed of the target. Made with blaze powder. Slow Falling: Decreases the target's falling speed. Made with materials from Petrinac. Weakness: Decreases the damage and mining speed of the target. Made with rotten flesh. Glowing: Causes the target to emit light. Made with a glowstone block. Purity: Reduces the target's wither, and cures Zombie Villagers. Made with a pearl. Wither: Increases the target's wither. Only effective when drunk; cannot be used on other player. Made with sludge. Nausea: Causes the screen to wobble a little. Blindness: Makes the screen darker and prevents sprinting. Hunger: Quickly drains saturation, then slowly drains hunger. Health Boost: Increases maximum health. Absorption: Adds temporary extra yellow health. Saturation: Quickly increases saturation, then slowly increases hunger. Luck: Target finds better treasure. Cursed: Target finds worse treasure. Burning: Target is on fire. This cannot be avoided with magic resistance. Paranoia: The target sees inanimate red Illusioners nearby. Rally: The target gets increased damage and speed. Splintered: The target slowly takes damage, similar to poison. If inflicted with Splintered while already Splintered, the target gains a level or Splintered, taking more damage. tl;dr, the Overworld has a lot of stuff in it. WHEW! I think I'm finally done. There was a lot to go over, so I tried to stay brief, but if you need something expanded on, let me know. Next time, we'll be going over the various layers of the underground! There's a lot of stuff here, and almost all of it sounds good. Since we don't know much about the rest of the game, it's hard to understand everything (for example, the Wither dungeon sounds cool as you described but I don't know what the new dimension it leads too is for). The trading system sounds much better, and I like using different gemstones instead of enchanting randomly. I don't think seasons are needed as we already have snowy biomes present, and an autumn forest could easily be added to the temperate biomes. By spitting the different biomes into greater "regions" and always spawning the player in the temperate zone, what if the hot and cold regions acted as different areas of game progression? They could spawn harder mobs and house better loot. Perhaps even a temperature system that comes into play. Your dungeon artwork is not in the Minecraft system, so I don't know what it would look like in game but it sounds solid and quite creative. I especially like how you created "ruined" ocean monuments and mansions. Which leads me too.. If the game technically takes place "after the first game" what if the world was significantly different. This could add a lot of relevance to the "Minecraft sequel". A new "abandoned base" could spawn on the surface as a tier 1 dungeon, where the Steve and Alex used to live now occupied by a forgotten angry iron golem. The Ender Dragon is dead upon arrival. Villages are more advanced- perhaps over the centuries they have gone from a medieval age to an age of exploration (explaining pirates) and now sport muskets. I think this would variate the two games and give a "story" reason to the sequel's existence, rather than just replacing the classic. Maybe the player's journey is ever since the death of the fearsome dragon, the undead have gone unchecked and the withers threaten to return. The player must go to the End to revive the Ender Dragon, directly complimenting the first game. But in all seriousness, I love all of this. You've put a ton of detail into it, and the content you proposed works brilliantly. Something I do have to say is that I would put the spot where the hopping skulls split open on their mouths for... obvious reasons. I personally always liked the idea of seasons, and I feel that it can be implemented in a way that feels like it's naturally increasing difficulty, rather than the artificial means of regional difficulty. Petrinac, the home of the wither beasts, will be discussed in Part 9, and is the center of the game's "plot." By spitting the different biomes into greater "regions" and always spawning the player in the temperate zone, what if the hot and cold regions acted as different areas of game progression? They could spawn harder mobs and house better loot. Perhaps even a temperature system that comes into play. I mean, there's already harder enemies like husks, sand worms, and strays, but perhaps that could be explored further. I did want to add a temperature system, but that tends to be dismissed immediately (but so is Minecraft 2, I guess). I did have the idea of an optional "real survival" mode that had more survival elements than the current game, but I'll probably discuss that in an appendix. Your dungeon artwork is not in the Minecraft system, so I don't know what it would look like in game but it sounds solid and quite creative. I especially like how you created "ruined" ocean monuments and mansions. Which leads me too..
Yeah, I'm terrible at building cool-looking structures in Minecraft, so some simplified concept art was the best I could do. I like the ideas, though I want to avoid forcing any kind of lore into the game. The End is not present within the game (at least, at launch; maybe there would eventually be an "End Update"), so its up to the player to come up with what happened to its denizens and the Ender Dragon. There are abandoned bases, in the form of the various ruins that spawn, but I don't know about an abandoned base as a dungeon; perhaps it would fit as an underground dungeon. I don't want to give the villagers any weapons because I feel that undermines the point of protecting them; however, they are more advanced. For example, the priest heals damage villagers, the villages in general are larger, and they have a stronger economy, evidenced by their sudden need to have a bank. The Wither does return, and is a focal point of the game. However, as I want to avoid copying Story Mode, as well as the first game in general, it's not the final boss. In fact, it's pretty weak compared to the true evil threatening to decay everything in existence. But we'll get to that later. Hopefully. Anyways, I noticed that you said Almost all of it looks good. Can you tell me what you didn't like? Thank you! Yeah, I probably should of thought of that-as well as made the inside of their skull glow as well. Still, it's only concept art, and I copied it from the Wither texture. It would look different in the final game. By the way, the Keep of the Illusioner was partly inspired by Yggdrasil. What can I say, if you can get someone to program this, make it a thing. DPing to hit that 100.
piano, like current Minecraft, but there will also be a large variety of instruments to supplement. Minecraft actually already chooses songs in the Overworld based on time of day and what you're doing. You always hear short songs in the morning and evening, cheery ones while underground or at midday, and generally nothing when it starts raining, snowing, or thundering, at least for a while. EDIT: Maybe there should be themes for monster fights specifically though. Something similar to what is played in Bendy and the Ink Machine when you first encounter the Chapter 3 enemies would be nice. That would be nice--unfortunately I doubt anyone would be willing to set aside a few months, unpaid, to make a prototype, and I have a lot of learning myself to make it. I don't think it's against the rules unless its for the sake of bumping a thread, but I'm pretty sure double posting is frowned upon. The wiki states its purely random, cueing at sunrise, noon, sunset, and midnight. I don't think it mentions the music being affected by weather, though it could be an accidental omission. There's already boss themes, and the music changes when fighting an enemy. I think a specific theme for monsters could hurt immersion. I've never noticed any music start playing around enemies other than the Enderdragon's wind-chime theme. I meant the suggestion includes dynamic music for fighting enemies. The current game doesn't, which is why I'm suggesting it. That actually would be pretty neat, eh? I always hear mobs in caves below the surface or see them at a distance in a ravine before I actually get in a fight with one. The buildup for taking on your first creeper or ghast could be climaxed a lot with some music, for sure.